Voice over Internet Protocol (VoIP) technology is nothing new, but businesses continue to experience new benefits from making the switch. 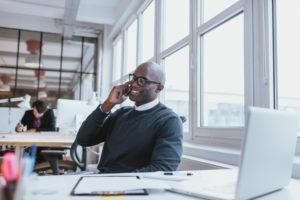 If you’re still on the fence about VoIP in 2019, it’s time to take a closer look at the reasons why so many businesses love it and explore whether or not it could be an excellent fit for you. Your business will never be the same again! The average business currently using traditional hardwired phones saves 30% when switching to VoIP phone systems. In some cases, you can save up to 40% on local calls and 90% on international calls. VoIP systems typically have lower setup costs, on top of using your internet connection and eliminating the need for installing phone lines. Do you already pay for your telephone and internet separately? Skip the confusion and switch to Voice over Internet Protocol. You’ll get a single bill every month and only pay for your internet. You can make as many VoIP calls as you need to, and the connection cost will remain the same. Do you have remote employees or employees who are frequently on the road? VoIP allows your employees to take their phone number with them wherever they go. Your employees will be able to use a convenient VoIP portal to access your capabilities, answer calls, make calls and more. You also will have the ability to call employees on a variety of devices, including their phones, laptops, tablets and traditional phones without needing to set up a new number. Voice quality matters a great deal, especially when you are utilizing Voice over Internet Protocol to make business calls. As long as you have a reliable internet connection and adequate bandwidth, your voice quality will be just as good as over a traditional phone line, if not better. Until with Private Branch Exchange telephone systems, which have a limited number of phones to add to the system, VoIP allows for unlimited scalability providing you have the right bandwidth to support them. Another new year means new security threats affecting everything at your business, from the VoIP phones you use to keep in touch with clients to the personal phones your employees use to communicate. Prevention is key to guarding your business against the biggest VoIP security threats, so today we are running through the top threats on the horizon in 2019. If you had the choice between creating a long, complex password or saying a few words to log in with your voice, which would you choose? Most people would choose the latter, which makes voice authenticated applications a unique threat for many businesses. While many systems can identify human imitation to prevent hacking, many cannot detect sophisticated machine-based attacks where the hacker uses a computer and speaker to play back actual voice recordings of the person. If someone’s voice is recorded, it can be used to create a computer model that can speak any words in your voice. The dangerous consequences of voice hacking could be anything from using the voice to log in to a voice-authenticated application to calling your company’s bank on your behalf. If you have a VoIP system that is not secure, voice hacking could happen to you. Toll Fraud: Hackers will route international calls through your VoIP server and rack up a huge amount of phone charges. Eavesdropping: Hackers can drop in on unencrypted voice calls to gather information that could be leveraged in other hacking schemes. Distributed Denial of Service (DDoS): These attacks occur when a deluge of data requests are transmitted on a single target, which shuts it down as a result. 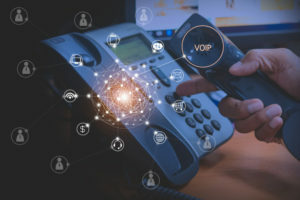 Another VoIP-related security vulnerability expected to be exploited in 2019 is SIP trunk hacking. SIP trunks, like any other type of internet system, can be hacked. Weak security and passwords, high volumes of access requests and eavesdropping are all threats. Make sure that all of your employees have strong passwords and logins that couldn’t be easily guessed. Partnering with a good service provider will also ensure that you benefit from secure SIP trunking and features like dedicated connections. What is Hot Desking on a VoIP Phone System? We get asked this question a lot so I wanted to feature it in our blog. I’ll go over the actual feature of Hot Desking, and then talk about how to apply it to gain efficiency in your business. Hot Desking is simply the ability to log into any phone on your system, and have your user profile and settings populated onto that device. An IP phone is pushed information and processing power from the PBX (your phone server). Because of this, you can go to any end point and log in, which essentially tells your phone system to push your specific profile to that phone. With Hot Desking, your extension is whatever phone you’re currently logged into. Hot Desking can help accommodate your efficient use of office space. “Hoteling” is a concept that is become more popular in corporate America. It allows workers to commute to the most convenient office, and to whichever work station they please, any given day. In a “Hoteling” scenario the employee would setup their laptop and log into the phone at that work station. All of their calls and messages would now be sent to that IP phone. Hoteling is just one practical application for deploying the Hot Desking feature at your business. How about an employee who has to travel to another part of the office to prepare a presentation? Once they get to the work area, they can log into that phone so they’re fully functional and efficient even while away from their desk. Law firms often have multiple offices in the same region, to best accommodate their clientele. It’s common for a lawyer to work in the Baltimore office on Monday and Tuesday, have a deposition at the Washington DC office on Wednesday, and then client meetings in the Annapolis office on Thursday and Friday. Hot Desking is the perfect application in this scenario because the attorney can log in on any phone in each office and be fully connected. No more searching and guessing to find out what office they’re working out of today. Medical offices with multiple locations also see a great benefit in Hot Desking. An optometrist may have five or six offices in a thirty mile radius, and he or she will typically travel and work out of each of them, depending on the week. With Hot Desking, they’re always connected to their voice mail, and easily accessible via their extension number. If you have any more questions about Hot Desking, please reach out to us. McEnroe Voice & Data implements business phone systems and voice networks for customers in the Mid-Atlantic, including Southern PA, Baltimore, Washington DC, and Northern Virginia. Posted in Business phone system, Mobility, VOIP, VOIP Business Phone Systems | Comments Off on What is Hot Desking on a VoIP Phone System?